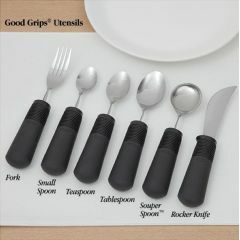 AllegroMedical.com presents The Good Grips Stainless Steel Utensils. Cushioned grip keeps the utensil in the hand–even when wet. Good Grips® stainless steel utensils feature a 1-3/8" (3.5cm) built-up handle. The soft, latex-free material has flexible ribbing that adapts to any grip. This handle design is so unique, it has a U.S. patent. Persons with hand arthritis, neurological impairments or generalized weakness will find these utensils comfortable, less stressful to hold and easily adaptable. Includes a fork, small spoon, teaspoon, tablespoon, and rocker knife. All utensils are institutional dishwasher safe. The forks and spoons have a special twist built into the metal shaft that allows them to be bent to any angle, for either left- or right-handed use. This is a great solution for persons with limited hand-to-mouth reach. Persons with hand arthritis, neurological impairments or generalized weakness will find these utensils comfortable, less stressful to hold and easily adaptable. The Souper Spoon™ with raised lip is idea for persons with tremors, poor hand control, arthritis, stroke, or Parkinson's disease. The innovative lip is specially designed to keep liquids and food on the spoon while moving from the plate to the mouth. Easy grip. Easy grip. Easy grip. My husband has neuropathy and this really helps him grasp. Due to advanced arthritis, my dad has limited grip in his hands and inability to bend his wrists very much. These bendable utensils looked promising, and with a little practice and a few adjustments through trial and error, I think they could help him get food to his more mouth easily. But he got frustrated and discouraged and has decided they couldn't possibly work, so he quit using them after a couple meals. I am hoping he'll rethink his decision and experiment with them because, in theory, the design makes total sense. Which of the utensils are included in the sample kit? Is it one each of all 6? The Sample Kit includes a fork, small spoon, teaspoon, tablespoon, and rocker knife. What is in the Good Grips Sample kit? It is hard to tell.